RMLA featured in LandFX Software Brochure...Again! Here we are again in October growing our team! After a great year of adding projects over the state, RMLA needed another set of capable hands in the office. Mackenzie Kroon stepped into the studio with great energy, professionalism, experience, and we knew she was the one. After years of working in an architecture office, she is now enjoying applying her landscape architecture degree full the full extent and getting her hands dirty. Welcome Mackenzie! Every year LandFX, a great drafting program for landscape architects, selects some of their favorite photos of completed projects that have been designed with their software. In 2015, they chose a couple from RMLA. Thanks LandFX for your great program and support. LOS ANGELES (June 18, 2015) – RMLA was recognized at the 45th Annual Los Angeles Architectural Awards today during a gala luncheon hosted by the Los Angeles Business Council. More than 40 world-class projects from a diverse spectrum of the architectural field were celebrated at the Beverly Hilton Hotel for their design excellence and community impact. Featuring an engaging keynote address by world-renowned architect Shigeru Ban, winner of the 2014 Pritzker Architecture Prize, the annual event drew a crowd of approximately 600 of the region’s leading architects, designers, building professionals and media. Entire project teams – including building owners, designers, contractors and developers – were honored for their contributions to exceptional design in L.A. County and beyond. A distinguished jury of owners, contractors, architects and civic leaders selected this year’s winners from hundreds of submissions. The Grand Prize went to the project team behind the restoration of the iconic, Frank Lloyd Wright-designed Hollyhock House. Councilmember Bob Blumenfield, LADWP Director of Economic Development Kecia Washington and Haworth Director of Business Development Ron Frantz honored the winners of a new competition—the LADWP Community Impact Award Landscape Design Competition— which recognized projects for outstanding innovation in environmentally conscious and water conserving landscape architecture. For the fourth year in a row, the Architectural Awards featured a design contest among students at the top six architecture schools in Los Angeles County, in this case participating in an intensive two-week competition to develop a vision and design for the South Wetland Park Facility. A video about the 2015 Julius Shulman Emerging Talent Award student design competition is available at the LA Business Council’s website, www.labusinesscouncil.org. For 45 years, the LABC has hosted the Los Angeles Architectural Awards ceremony and luncheon to honor design teams for both their aesthetic vision and their contributions to the community as a whole. Please visit www.labusinesscouncil.org or contact michelle@sugermangroup.com for more information about the 2015 Architectural Awards, including video footage of the ceremony and photos of all project winners. October was a very exciting month with our office space coming together nicely, a handful of new and exciting projects coming into the fold, and most importantly, our team being joined by a dynamic and talented landscape architect, Susan Raymond. We look forward to introducing her to our current and future clients! 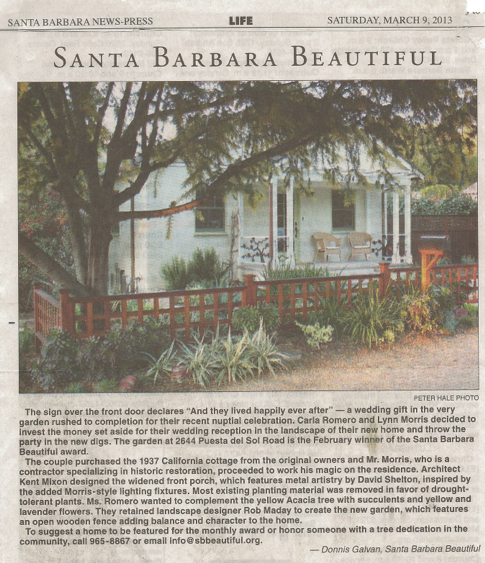 Our new address will be 1311 Anacapa St, Santa Barbara CA, 93101. Please drop in and visit in October! 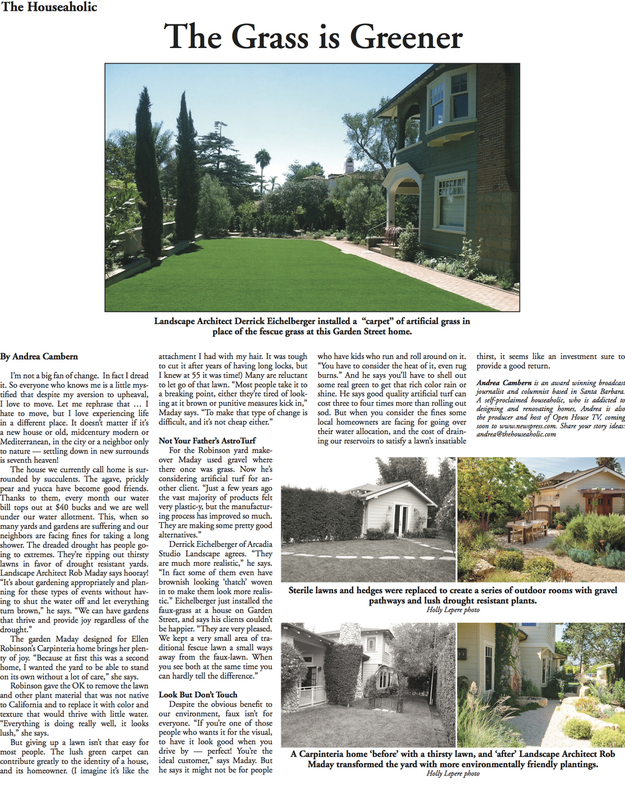 RMLA was awarded for their efforts in the February 2013 Monthly SB Beautiful Awards for its work on a charming 1937 California Cottage on Puesta del Sol Road.